Ricker shares more than fifty of the most popular recipes from Thailand and his Pok Pok restaurants—ranging from Khao Soi Kai (Northern Thai curry noodle soup with chicken) to Som Tam Thai (Central Thai–style papaya salad) to Pok Pok’s now-classic (and obsessed-over) Fish-Sauce Wings. 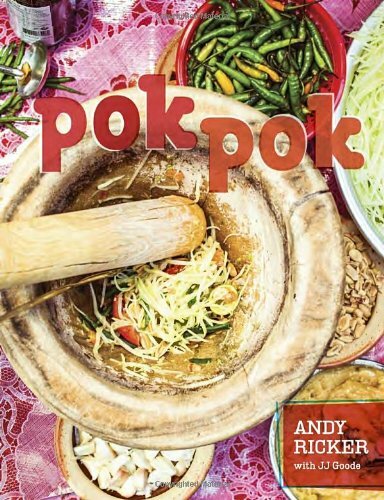 But Pok Pok is more than just a collection of favorite recipes: it is also a master course in Thai cooking from one of the most passionate and knowledgeable authorities on the subject. Clearly written, impeccably tested recipes teach you how to source ingredients; master fundamental Thai cooking techniques and skills; understand flavor profiles that are unique to Southeast Asian cuisine; and combine various dishes to create show-stopping, well-balanced meals for family and friends. Another win for Pok Pok! This recipe is bit labor intensive, but turned out great. I subbed chicken instead of pork and bok choy instead of broccoli. Also, I used oyster sauce in place of the dark soy sauce. The final flavor was great but needed a little something extra. I added a small drizzle of chili oil and would have added a squeeze of lime if I had it. All in all, delicious. I made this with my boyfriend Kenny, high on Thai flavors following an August trip to Thailand. It took us a few weeks to find crab, since it was out of season but we finally stumbled on some previously frozen crab and jumped at the chance of making this dish. It's a relatively easy dish, but even if it weren't worth any amount of time it would take to make—it was delicious, we devoured all of it in one sitting. It was a very messy dish, be ready with paper towels and a bib or apron.